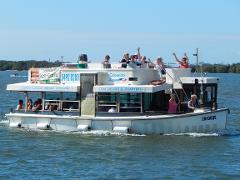 Saturday only -This 1 hour 20 minute cruise departs Pelican Waters Tavern jetty at 10.30am and returns in time for lunch. See the best of new Pelican Waters development and the Marine Park. Note - Cruise does not stop in Caloundra. "Smoothwater Classic" from either of Pelican Waters Tavern or Maloja Jetty, Tripcony Lane . (Tues, Wed, Thurs, Fri & Sun) Gift card also valid for Saturday "Skipper's Choice"